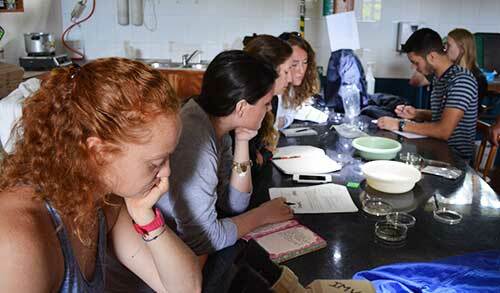 University of Lynchburg in partnership with University of Georgia Costa Rica have initiated a program to involve students in water quality investigation and learning opportunities abroad. 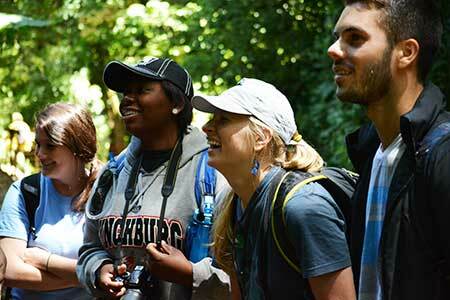 This program allows students to intern on the UGA-CR campus learning about tropical ecology and life in Costa Rica. Each semester a student lives and works with Costa Ricans learning about food supply, water supply and treatment, stream ecology, forest ecology and social life. Students complete associated course work, learn Spanish and help throughout the community. The research and coursework is supervised by professors from University of Georgia and University of Lynchburg. Staff and other interns located on UGA-CR work and supervise students in daily life and work in the community. Students also have the opportunity to conduct short (2-3 week) learning opportunities traveling throughout Costa Rica and learning first-hand about the research project. The program provides each student the opportunity to experience Costa Rican culture and the challenges of providing clean, healthy water throughout the world. Travel to Costa Rica to experience diverse ecosystems, immerse yourself into the culture, and gain hands on field experience! The study abroad Costa Rica program is a 2-3 week intensive program, designed to introduce students to Environmental Sustainability, Water Quality, and ecosystem diversity throughout Costa Rica, all while experiencing the Costa Rican culture. 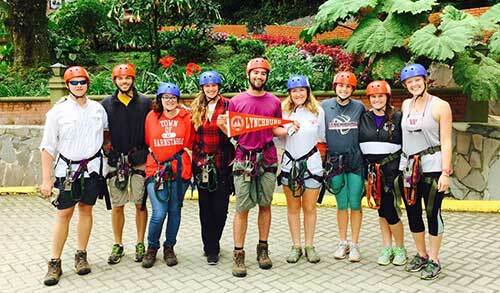 You would travel with University of Lynchburg and Costa Rica-based instructors, following a prepared itinerary (see example – 2016 itinerary). This study abroad program, like others, integrates students from University of Lynchburg into a class-like atmosphere while learning about Costa Rica’s wildlife, water quality issues, and many more topics that are introduced during this trip. While on this trip, the University of Georgia provides University of Lynchburg students housing on their Costa Rica campus and use of the facilities as well as receive daily meals. There is coursework to be completed at the end of the trip, enhancing the learning experience. At the end of the 2-3 week program, it is expected students turn in an assignment related to daily experiences in order to receive credit for the course. This program satisfies both the Environmental Science and Environmental Studies experiential learning component for degree requirements. Typically student trips average $100 a day, including transportation, food, lodging, and excursions. Food: $5-15 per day — this varies. Some meals are provided and others you must pay for. 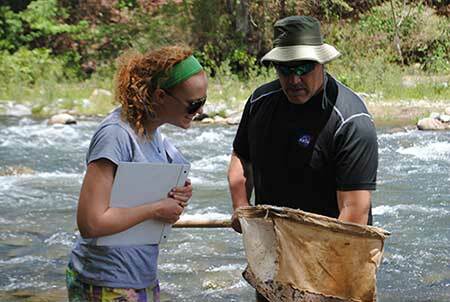 LC offers a unique experience that allows students to immerse themselves into the Costa Rican community while conducting independent research as the Water Quality intern at the University of Georgia’s Costa Rica campus. Not only will the student manage freshwater research in the beautiful Bell-Bird Biological Corridor, they will gain hands-on field experience, working extensively with macroinvertebrates collection and identification, data management, and fellow UGA Costa Rica researchers and interns. Previous internship students used the opportunity to further their research, using it towards Honors in their major, as well as thesis defense for Lynchburg’s Westover Program. During her time in Costa Rica, Jade worked as the Water Quality intern and assisted with sampling, identification of macroinvertebrates, data analysis, and data management. She received her degree in Environmental Science, with a minor in Photography. Jade was an intern during the summer of 2015, and stayed in Costa Rica for 6 weeks. 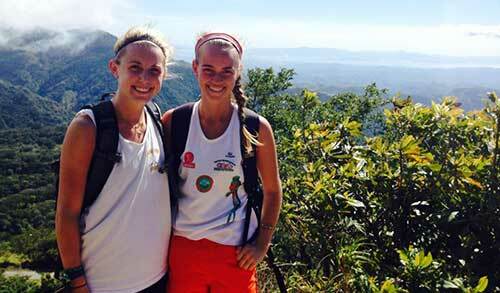 Helen’s study abroad experience in Costa Rica inspired her to return for an internship. During her time there, she was in charge of the water quality project, which provided her with hands-on research experience. Helen’s favorite part of the adventure was being out in the field, meeting people both from the community and fellow interns and naturalists at UGA Costa Rica. Internship opportunities are available in summer, spring, and fall. Room and board is provided as part of the internship by UGA Costa Rica facilities, making students only financially responsible for tuition to University of Lynchburg and flights to and from Costa Rica. Students enroll in independent study courses from University of Lynchburg and can also receive internship credit. Students need a basic understanding of Spanish with a minimum of Spanish 201 at University of Lynchburg, or the equivalent through an AP course or community college courses. This internship opportunity is one of a kind, allowing students with diverse interests and backgrounds to gain experience that could potentially distinguish them from other applicants for employment and graduate school. In 2012, the Water Quality Center began a multi-year partnership with The University of Georgia Costa Rica to study water quality in three river systems throughout the Bellbird Biological Corridor. The venture comprises many goals, not simply aimed at improving the water quality, but also heightening awareness concerning land use, stream monitoring of water pollution and student engagement. The corridor is uniquely positioned along the Pacific Slope incorporating the area of Monteverde Cloud Forest in the headwaters, providing a pristine originating water source for study. As water flows down the slope, it encounters various levels of development, farms of differing sizes and scopes, hydroelectric projects, multi-use by citizens, and levels of stream bed alteration. Water quality and quantity changes are striking. This project comprises quantifying how these changes influence water quality, and developing various monitoring techniques to engage students, community members, corridor staff and government officials.